Welcome to the worlds greatest guide to Women's Cashmere Shirts. 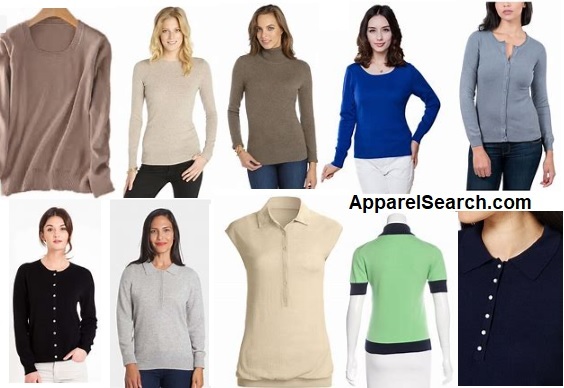 Are you actually looking for ladies cashmere shirts? A shirt is a garment for the upper body made of various types of fabrics. It is a cloth garment for the upper body (from the neck to the waist). Many women's shirts have a collar, sleeves, and buttons down the front. However, that is not an absolute requirement. Cashmere is a fine wool which is soft and provides warmth. It is a luxurious fabric and is splendid for making shirts, sweaters, and other tops for women. Their are many different types of shirts. You can find camp shirts, dress shirts, polo shirts, henley shirts, sweatshirts, tees, etc. The use of cashmere can be utilized in a wide assortment of shirt styles. You can even find t-shirts made with cashmere. The fiber is often blended with other fibers, but 100% cashmere can also be found in the market. Learn more about cashmere wool from our textile & fiber definitions area. Learn about different types of shirts in our apparel industry terminology section.